Albert Payson Terhune was born on December 21, 1872 in Newark, New Jersey (2003). 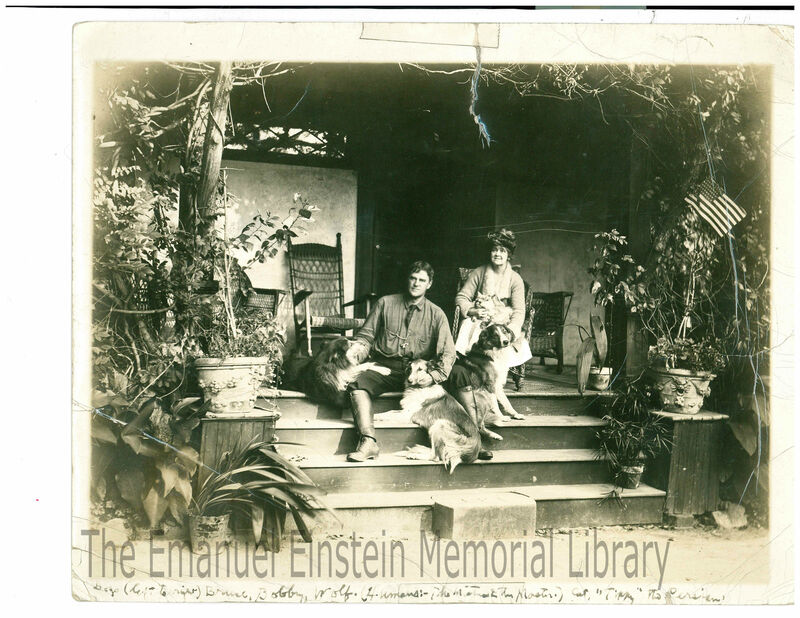 He is pictured here with his second wife Anice Terhune on the porch of their home on the Sunnybank estate property-now known as a literary landmark (and dog park) (Haggin, 1999). Terhune is an author (best known for his dog stories) with one of his more popular books being “Lad: A Dog” (1999). He had a love of dogs and his stories made an impact on many of his readers in a profound way-“…in some ineffable way he transmuted his great loves into the hearts of other people so that they loved them almost as intensely as he did” (Irving, 1977: 7). Albert Payson Terhune’s own dogs, featured in his books, became loved by so many that one of his dogs had a write up in “The New York Times” when he was killed by a train (Gale, 2000). Some of his stories are: Lad: A Dog, Bruce, Buff: A Collie, and other Dog Stories, and further adventures of Lad. In 1942 Terhune died at his home (Sunnybank), but he left behind a legacy and stories that still bring back special memories for many (2003). I recently spoke with a woman who grew up reading Terhune’s stories as a child, and when I mentioned his name her face lit up. There is something about childhood stories that can bring about so much joy. The Sunnybank estate property was owned by the Terhunes since the 1850s (Royal, 1965). The Terhune home is no longer standing, but Sunnybank property is now a dog park (one in which I often visited with my dog (Haggin, 1999). When Terhune lived there he grew weary of the changes that were happening around the estate and the droves of people that were visiting from bigger cities (Irving, 1977: 110). His opinion of this sometimes came out in his writings-he wished things could stay as they were without more and more buildings and mills (1977, 110). “In the Dictionary of Literary Biography, Edward Sichi, Jr., remarked that although Terhune’s works seem dated, “The author’s search for ways to link the past with the present, his interest in the beauty of nature, and his objections to the desecration of the countryside by encroaching commuters and commercial interests still strike responsive chords” (2003). Through the Vincentian Lens of Transparency, Terhune’s writings showed love and respect for animals, and he strived for excellence with his hard work as a writer. When Terhune became a freelance writer to focus on his books, he worked through long days at his typewriter which took a lot of discipline when he was on such beautiful property filled with distractions. Terhune is one example (out of many) of an author who still is making an impact today even though he is no longer alive. His park is one example of the beauty that comes when nature is preserved so that it can be enjoyed by everyone. Haggin, Leslie, “Literary Landmark: Author’s legacy lives on in park where his dog stories came alive,” The Record . January 11, 1999. Litvag, Irving. The Master of Sunnybank: A Biography of Albert Payson Terhune. New York, NY: Harper & Row Publishers, 1977. Gale, Robert L. “Terhune, Albert Payson.” American National Biography Online. Feb. 2000, accessed March, 21 2016, http:www.anb.org/articles/16/16-01616.html. “Albert Payson Terhune.” Contemporary Authors Online. Biography in context. 2003, accessed March 2, 2016. Royal, Susan, “The Terhune Story: It all Began in New Amsterdam,” The Trends, April 25, 1965. This entry was posted in Oakland Public Library, Oakland, NJ and tagged Albert Payson Terhune, Author, Books, Dogs, NJ, photograph, Pompton Lakes, Sunnybank. Bookmark the permalink.